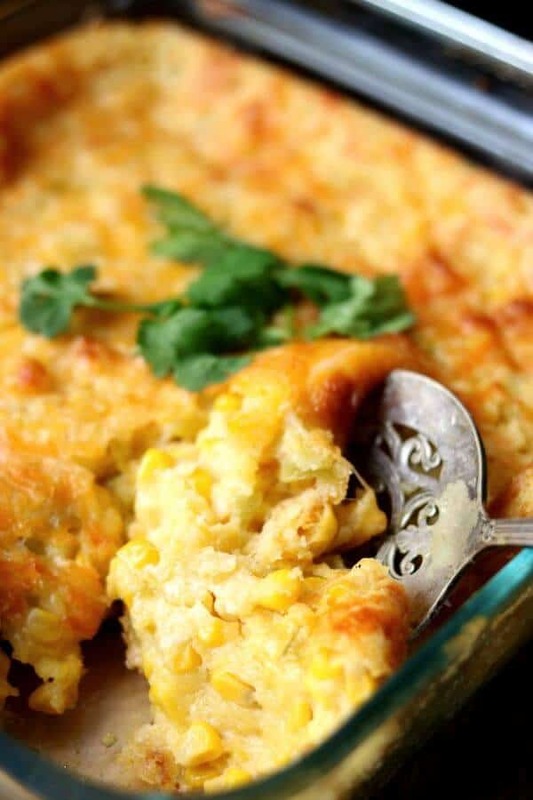 This Mexican Cornbread Casserole will add a little extra zip to all your holiday meals! I’ve taken the classic cornbread casserole recipe and updated it will a warm Tex-Mex twist for today’s #SundaySupper Holiday Casserole theme! What would holiday meals be without side dishes? There are only so many ways you can cook a turkey but there are so many recipes for side dishes that it can be hard to choose. If your family is anything like mine you tend to make the same things year after year with maybe one or two extra dishes that you’re “trying out”. Cornbread casserole is a Southern classic that makes its way to most Thanksgiving menus around here. In its basic form it’s super simple with some corn, dairy, eggs, and cornbread mix. That’s part of the popularity of this cornbread casserole recipe – it’s easy and it’s delicious. Our Thanksgiving dinners seem to end up being a mishmash of foods from numerous cultures but that’s about as American as it gets, if you ask me. I decided to take a Southern favorite and update it with some Tex-Mex ingredients. The result is a casserole with a ton of corn flavor and a touch of cumin and chile. It’s so good I can pretty much eat a whole dish by myself. Mexican cornbread casserole is not quite a cornbread and it’s not quite a vegetable dish but it is a little of both. It’s fabulous as a side dish to turkey or ham during the holidays but is just as good with steak or burgers any other time of the year. You can make some small changes to get big flavors with this easy side dish. In fact, you can even turn it into a main dish by adding some cooked meat. Add chili to the baking pan and spoon the Mexican cornbread casserole over it. Chop candied jalapenos up and add to the batter before baking. Drain a can of Ro*Tel tomatoes and add to the batter. Stir in cooked, shredded chicken before baking. I’m not sure but I think it’s a rule in the South that there’s no such thing as too many corn recipes on the table during the holidays. Just because you made a big old vat of cornbread dressing does not mean you can’t serve creamed corn (with plenty of pepper and butter) and corn casserole. This stuff is going to disappear, y’all. I like to cook it in a square glass baking pan for the holidays but other than that I like baking it in an iron skillet. A little too casual for my Thanksgiving holiday side dishes but just right for bbq! This is the easiest side dish ever but here are a few tips that might make it even easier. You can make this 2 to 3 days ahead of when you’ll need it and store in the refrigerator cooked or uncooked. You can also freeze it either baked or unbaked. Thaw overnight in the refrigerator before baking as directed in the recipe or warming at 300F for 20 minutes. Don’t overbake – it will get dry. Let the Mexican Cornbread Casserole stand for 10 minutes or so before serving to allow it to firm up. Perfect for everything from potluck dinners to holiday side dishes, this easy Mexican cornbread recipe is as welcome on the weekday table as it is on the holiday table! Love this recipe? Please consider giving it a star rating below. ? Follow me on Facebook and Pinterest! Quick and easy side dish that can be made up to two days ahead of time. It's perfect for Thanksgiving or summer barbecues. In a large bowl stir all of the ingredients together. Pour the ingredients into a greased 9x9 casserole dish. Bake uncovered for 45 minutes, or until the edges begin to brown. Remove from oven and let stand for at least 10 minutes. I have a huge weakness for cornbread and turning it into dinner sounds right up my alley! I can, and do, completely skip the turkey. This is exactly the kind of dish I gravitate to. I can’t wait to make it! 🙂 let me know what you think! I don’t think my family would complain with another corn dish on the table! Your cornbread casserole looks terrific!! Thanks Liz! I love this easy recipe!